Can People With Diabetes Eat Pineapple? Pineapple is a sweet fruit that many diabetics shy away from because of its presumed effect on blood sugar. But is it something that you need to avoid like the plague, or can it be consumed safely without any ill effects on your health? Generally speaking, it is a myth that people with diabetes need to avoid fruit. Fruit is a healthy food source of vitamins, minerals, and fiber and avoiding them can deprive your body of much-needed antioxidants, folate, bioflavonoids, and potassium. If you are diabetic, you can eat fruit but simply need to limit your intake since it will invariably contain carbohydrates. Carbohydrates are the macronutrients which impact the blood sugar most. The amount can vary from one fruit to the next with some "less sweet" fruits having more carbs than sweeter ones. We measure these values using a system called the glycemic index (GI) which ranks how fast carbohydrate-based foods can raise your blood sugar level. High-GI foods (with a ranking over 70) will raise your blood sugar and insulin levels quicker than low-GI foods (55 or under). Ultimately, it's not so much about whether or not you can eat fruit but how much you consume within the constraints of your recommended diet. Pineapple is a fat-free food rich in fiber and vitamins. Fiber is especially important to diabetics as it can help to lower blood sugar, reduce cholesterol, and regulate bowels. In fact, a single, one-cup serving of fresh pineapple has an impressive 2.2 grams of fiber with only 78 calories. However, pineapple also has a relatively high GI ranking compared to other fruits. 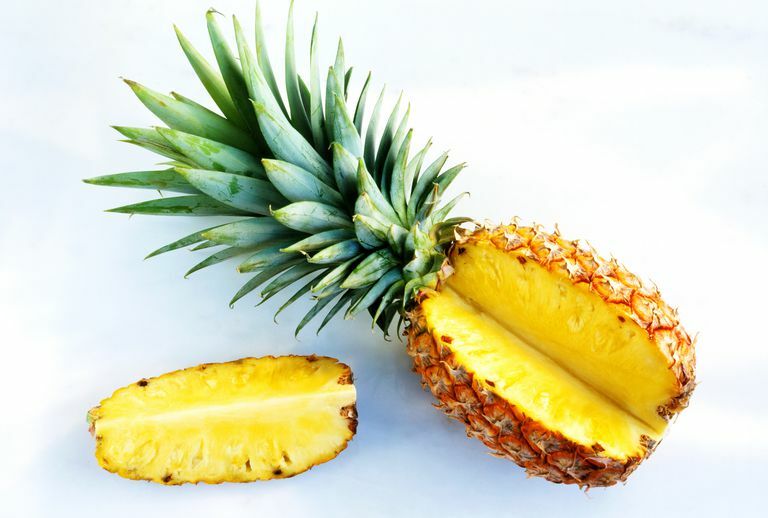 According to an analysis from the Institute of Obesity, Nutrition, and Exercise at the University of Sydney, fresh whole pineapple has a GI ranking of 59, placing it at the lower end of the moderate range. By contrast, unsweetened pineapple juice has a far lower GI ranking due to the removal of solid carbohydrates. Tinned fruit in juice has more or less the same GI ranking as fresh pineapple. Tinned pineapple in syrup is simply a "no-no" for anyone with diabetes. While the higher GI ranking may suggest that pineapples are not for you, there are ways to eat them safely if you have diabetes. Even in smaller amounts, pineapple can arguably satisfy a sweet tooth more than, say, an apple or grapefruit and not make you feel deprived if you have a sudden craving. If you love pineapple, stick to one portion and pair it with a protein such as low-fat cottage cheese or Greek yogurt. Or, you can add it to a chicken stirfry for a little pop of sweetness. If you're including pineapple as part of a meal (such as grill pork and pineapple), consider eating the protein first. There is some evidence that doing so can help slow the rise in blood sugar. When it comes to making smart dietary choices, moderation is always key. Take the time to read food labels, and do the research to understand how certain foods may or may not affect you. By doing so, you'll be able to avoid fluctuations in your blood sugar and achieve better control of your diabetes over the long term. Atkinson, F.; Foster-Powell, K.; and Brand-Miller, J. "International Tables of Glycemic Index and Glycemic Load Values: 2008." Diabetes Care. 2008; 31(12):2281-3. DOI: 10.2337/dc08-1239. Shukla, A.; Iliescu, R.; Thomas, C. et al. "Food Order Has a Significant Impact on Postprandial Glucose and Insulin Levels." Diabetes Care. 2015; 38(7):e98-e99. DOI: 10.2337/dc15-0429.